Cyber security in healthcare is growing at a robust rate owing to the rising need to secure the network across the healthcare organization. Increasing cyber-attacks across healthcare institution coupled with the growing number of healthcare sectors are also expected to fuel the market growth. 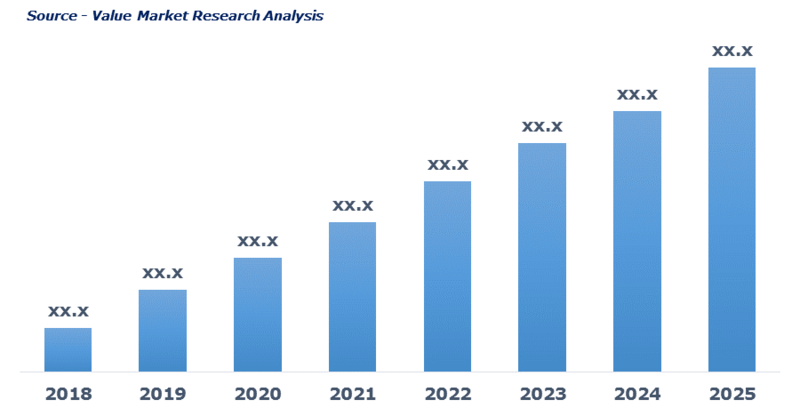 Moreover, rising government support and various act to protect patents data along with the increasing adoption of cloud services is again augmenting the market growth. Also, rising usage of laptops, tablets, smartphones, and other mobile devices along with the adoption of connecting medical devices and digital medical record system is further anticipated to support the market growth over the forecasted timeline. As per the latest report added by Value Market Research, the Global Cyber Security In Healthcare Market was valued USD 7.0 BN (by revenue) in 2018 and is anticipated to reach USD 11.2 BN by 2025 with a CAGR of 7%. At present on-premises are currently high in demand it offers control over an environment kept in-house. Also, it doesn't require a wireless internet connection to retrieve clinical data which makes them less risky due to which organizations wants to deploy this storage solution in order to feel most secure. Therefore, rising need to secure networks of healthcare in order to prevent breaching of patients information is expected to expand the segment growth. Application security is ruling the cybersecurity in the healthcare market owing to the rise in the incidence of cyber-attacks. Moreover, growing cases of patent infringement cases, medical identity fraud, and loss of patient health record are anticipated to augment the segment growth. Pharmaceutical and chemical manufacturers end-user segment are dominating owing to rising cyber-attacks on medical device companies. Also, the rising number of fraud cases in pharma companies is further fueling segment growth. Currently, North America is dominating the market owing to the strong presence of healthcare sectors along with the rapid adoption of healthcare IT. Also, rising spendings on R&D in order to develop an advanced storage solution in order to secure the healthcare network is further anticipated to expand the market presence in the region. As per this study the Global Cyber Security In Healthcare Market was valued USD 7.0 BN (by revenue) in 2018 and is anticipated to reach USD 11.2 BN by 2025 with a CAGR of 7%. Cyber security in healthcare offers protection to patient’s data from cyber attack and data breaches. Apart from this, it also protects financial information, intellectual property and other confidential data that is vulnerable to cyber attacks. Hospitals, clinics, nursing home and other medical facilities face high rate of cyber attack since they are rice source of data with weak defense system. Rising adoption of IoT for wearable, handheld devices, telemedicine and implants to monitor activity has lead high risk of cyber attack. Growing cases of cyber attack to obtain quick access to patient’s data, financial information and other confidential data have generated huge demand for cyber security. Development in sophisticated techniques and tools to gain access data by the hackers is again boosting the need of cyber security. This detailed market study is centered on the data obtained from multiple sources and is analyzed using numerous tools including porter’s five forces analysis, market attractiveness analysis and value chain analysis. These tools are employed to gain insights of the potential value of the market facilitating the business strategists with the latest growth opportunities. Additionally, these tools also provide a detailed analysis of each application/product segment in the global market of cyber security in healthcare. The broad cyber security in healthcare market has been sub-grouped into product, application and end-user. The report studies these subsets with respect to the geographical segmentation. The strategists can gain a detailed insight and devise appropriate strategies to target specific market. This detail will lead to a focused approach leading to identification of better opportunities. Furthermore, the report comprises of the geographical segmentation, which mainly focuses on current and forecast demand for cybersecurity in healthcare in North America, Europe, Asia Pacific, Latin America, and Middle East & Africa. The report further focuses on demand for individual application segments in all the regions. The report also covers detailed competitive landscape including company profiles of key players operating in the global market. The key players in the cyber security in healthcare market includes AO Kaspersky Lab, Axway, Biscom Incorporated, Booz Allen Hamilton Inc., CISCO, Computer Sciences Corporation, CORL Technologies, FireEye, Inc., Flexera, ForgeRock, GENERAL ELECTRIC COMPANY, IBM Corporation, Lockheed Martin Corporation, McAfee, LLC, Northrop Grumma Corporation, Palo Alto Networks, Inc., SENSATO, Symantec Corporation, Trend Micro Incorporated and WhiteHat Security. An in-depth view of the competitive outlook includes future capacities, key mergers & acquisitions, financial overview, partnerships, collaborations, new product launches, new product developments and other developments with information in terms of H.Q.